A research paper authored by R. Rajbhandari and others and published recently in the journal, Climate Dynamics predicts that the 1.1 million sq. 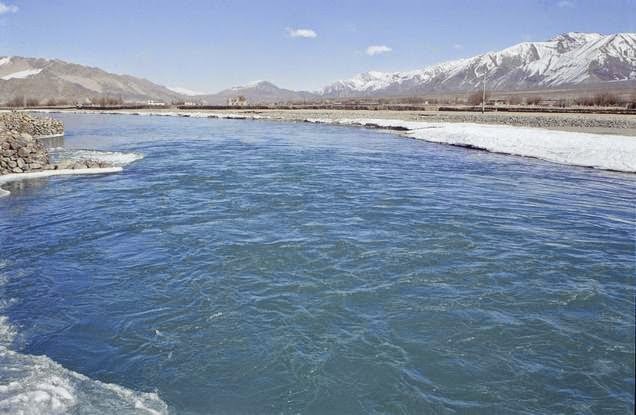 km basin of Indus river, shared by India, Pakistan, Afghanistan and China, is expected to warm significantly and progressively, with average temperatures set to increase by around 4 degrees C by 2080. The paper titled as “ Projected changes in climate over the Indus river basin using a high resolution regional climate model (PRECIS)” says that the resulting warmer winters in the plains, quicker snow melt in the basin's northern highlands (comprising parts of the Hindu Kush, Karakorum, and Himalayas) and more frequent flash floods at the foothills can be expected over the next seven decades, altering the basin’s hydrology. Winter in the Indus basin on average could be warmer by 3.9 to 5.1 degrees C, and summers by 3.4 to 4.6 degrees C.
The paper adds that by 2080, the number of rainy days over the basin will increase and the intensity of rainfall is likely to rise in the foothills of the Hindukush and other highlands — an area that is already prone to flash floods. Northern highlands could get hotter, and snow and glacier melt likely to hasten. The most affected will be people with least adaptation capacity. Farmers may be left with no choice but to change their cropping patterns, perhaps even their crops. We might as well assume that the report gives us a fairly true picture of what is going to happen in next seven decades in the Indus basin as the report has been published by well qualified experts in the field. However, it is entirely possible that many people are likely to get alarmed by these predictions, but any one, who knows about the long term weather history of the region, would find nothing abnormal or extraordinary in these predictions as this is what has been happening here for last 10000 years and that is why Indus civilization flourished here once only to get extinguished later. Another study about Indus basin, this time about the past history of the Indus basin, was published on 28th May 2012 in the Proceedings of the National Academy of Sciences and lead authored by Liviu Giosan, a geologist with Woods Hole Oceanographic Institution (WHOI). This report claimed to have found the answers to the question as to why once flourishing Indus civilization had suddenly collapsed. The study was done from 2003 to 2008 from the Arabian Sea coast to the fertile valleys of Punjab and the northern Thar Desert in Pakistan. Over this period, Liviu Giosan's team of 15 international experts, which Included Prof Ronojoy Adhikari of the Institute of Mathematical Sciences, Chennai, studied satellite photos and topographic data collected by the Shuttle Radar Topography Mission. From this data the team created digital maps of landforms in the basins of Indus and other rivers. This analytical work was then confirmed with help of field work in the area, consisting of drilling, taking core samples and digging deep trenches to study cross-sectional views. With this data, it was possible for Giosan's team to reconstruct the landscape of the plains habitated by Indus civilization 5200 years ago (3100 BCE), how the great cities like Harrapa were built and the gradual disintegration of the plains that took place in a period 3900 to 3000 years ago (1800 BCE- 900 BCE). Armed with this information, Giosan's team was able to draw following conclusions. Spread over 1 million square Km. From Arabian sea coast to Ganges, the Indus civilization was the largest but least known civilization of the first urban cultures of the world. This civilization, like other great civilizations of Egypt and Mesopotamia also flourished next to some great rivers. However, remains of this vast human settlement are found even in vast desert areas far from any rivers today. This south Asian culture, which might have contained one tenths of world's population in those days, was all forgotten till 1920. Subsequent archeological research has unearthed a sophisticated urban culture with myriad internal trade routes and well-established sea links with Mesopotamia, standards for building construction, sanitation systems, arts and crafts, and a yet-to-be deciphered writing system. Before this massive human habitation had settled in, for previous ten thousand years, wildly flowing river Indus and its tributaries had deposited rich soil sediments on stretches between them. The monsoon rains that brought floods to the rivers, actually started declining with time. Weakened monsoon rains and reduced run-off from the mountains, helped in taming the wild Indus and its Himalayan tributaries, so that agriculture along their banks became possible. As a result, human settlements bloomed along the Indus and its tributaries from the coast to the foothills of the Himalayas. The weakened monsoon rains created a window of about 2000 years in which Harappans took advantage of the opportunity and a great civilization arose on the banks of Indus and tributaries. Indus civilization, was built on bumper crop surpluses along the Indus and the Ghaggar-Hakra rivers from this earlier wetter era and required a huge concentration of workforce. This workforce requirement developed into great urban centers like Mohenjodaro and Harrapa. As monsoon weakened progressively, this window of prosperity began closing and widespread aridification of the lands, where plenty of water was available earlier, drove the Harappans eastwards east or towards Ganga river by 1500 BCE, where monsoon rains remained reliable. The economic structure in the east with local rain-fed farming and dwindling streams could only support smaller agricultural surpluses and could not support large cities of Indus civilization. The cities collapsed and with them the urban arts such as writing. The population in Ganga basin now dispersed in small agricultural communities, survived and even diversified. Readers would be immediately able the conclude that changing weather patterns have been more of a norm in the Indus basis as seen from this study of 10000 years and the inhabitants here have been continuously adopting their crop patterns and way of life, to the vagaries of nature or to be more specific depending upon the monsoon and the weather. We can safely assume therefore that even if the weather pattern changes as per the predictions of this research paper, there seems to be little cause of worry with cultivators cultivating the lands in the Indus basin with appropriate responses.